Red Lapillus from Cave Riunite is the best solution for improving, organizing and protecting green areas. Thanks to its lightness and reaction to air and water, it favours cultivated vegetarian quickly without stress. It can be used alone or blended with seedbed and potting soil. Does not required disinfestation since it is free of weeds, phytopathogenic micro organisms and other parasites. Thanks to its amazing versatility, it is ideal for use virtually anywhere, especially in clayey terrain where it improves the land’s structure and texture. 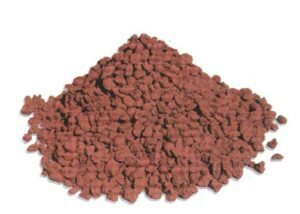 Thanks to its morphological and chemical-physical characteristics, Red Lapillus from Cave Riunite is being successfully used as a foundation for athletic fields, drainage systems above-ground crops and for lawns. Big Bag lapillo vulcanico yellow saccone da 1,5 MQ.